I have installed a "In Development" Store-Mod. It will allow you to buy "items" from the general Store "Brf Unlimited" or from personal stores. Right now, the only items available are "beer" which does nothing, and Lotto Scratch Cards which can be "Used" for a chance to win up to 100 JJ Bucks for your investment of only 1. unlike most Scratch-Offs, this one is setup to have zero "house-advantage". I will be adding more items as I create them. You can have your stores use TWG-Bucks too. I might set up a TWG-bucks store, I don't know. We need fried chicken and such snacks to pass around to accompany the beer. Are you sure you guys want the money and store additive? The trade window can be accessed from your Items screen, or from the Profile of the one you want to trade with. Once you have open a trade with someone, you create a "trade object". Click the "Change Offer" button, to select which items you are offering. You checkmark the items and click "Submit" to bring up the quantities screen. Fill in the quantities and click "Submit". Then, click to return to your trade-object to specify what items you want in return. Click the "Change Request" button to specify what items you want in return. Go through the steps above to check-mark, Submit, add quanitites and Submit again. Once you have done both sides of the trade, you need to return to that trade once again and click the submit button. Once you have submitted the trade, a PM will be sent to the other, notifying him that a trade-object exists. Before it is submitted, it can be accessed by either party from their Trade window by clicking on the status. Once both parties Click the Submit/Accept the trade, the items are traded and the trade-object is deleted. The trade-object can also be deleted by clicking the "Clear Trade" button. And I will take particular note of who puts in a design I don't like. Take a look at Maus' sig if you need more incentive. just out of curiosity, is their any way to get new items to sell? Are you taking suggestions? Considering that Brf has been hawking virtual beer to minors and using my name as a comedy sketch, my response to your question is YES! PLEASE DO! :? Yes. Suggestions are welcome. Darkness was also suggesting some pink and blue items to use as prizes. Forget the idea of buying ribbons. Won't happen. Then something along the same lines. You have Beer and whatnot in the sig already, why not do something similar? ribbons are for achievement, buying stuff is not. 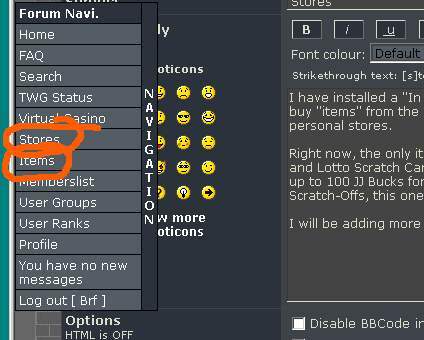 although something along the same lines might not be a bad idea, maybe add things that you can buy purely to add them to your sig, but that aren't ribbons and mean nothing? say things like an axe, asnd other castle-related things? I'm going to get these swords and garlic cloves out of the sigs. Own them? Fine. Display them? Don't like it.